Best Consular Blog. Dead, So Very Dead. And don’t you dare write another one! Madam le Consul went missing from the blogosphere 30 days ago today. If you go missing for more than 48 hours in real life, the chances of finding you drop precipitously. The chances of recovery in virtual disappearances, um don’t really know.But she’s gone.Missing for over 700 hours now. The trail is cold. Most likely dead. Just dead. And we can understand if she wants to stay dead for now. I imagine that there are folks out there who are relieved that though she may browse among us, she is now a ghost among us. And ghosts, you know, can’t be seen or heard, and have not been known to blog, yet. Dead blogger gone. End of line. Other folks out there, of course, still harbor hope that she comes back.Why, to continue our rudely interrupted conversation, of course.Dead bloggers like cylons (see Battlestar Galactica) have many resurrection ships nearby: WordPress.com, Tumblr.com, LiveJournal.com, Yahoo 360 and more … dead bloggers do not really go away, they just get new URLs. But I won’t be surprised if she stays dead. Every single day I also get somebody knocking on my door looking for MLC.I suspect that she is more popular now dead than she ever was, alive. If Madam le Consul is not resurrected, I hope her ghost starts micro-blogging on Twitter soon, if only to give the folks responsible for her demise nightmares and ulcers. Yup, I’m going to hell for wishing that. Whatever. I’m still royally pissed that I no longer have her company when I have coffee each morning. “The Consuls’ Files” — probably the best visa blog in the universe — has disappeared from our screens. Over a relatively short period of time, ‘Madam le Consul’ provided more consular education to more people than any of us would have thought possible. For her devoted audience, the reason for MLC’s sudden disappearance remains a mystery; that said, opinion in consular cyberspace is virtually unanimous that “The Consuls’ Files” was forced to close down by a skittish Bureau of Consular Affairs. For a brief few months, MLC provided us with an enhanced level of information regarding the world of consular officers. In so doing, she created more public trust and support for that world than any one person has done in a very long time. We are deeply saddened by the loss of “The Consuls’ Files” and thank MLC for having given so much in such a short period of time. Ah, the bad, old days. Don’t you just miss them? I’m not saying that MLC was a security risk or that the bureau is still trying to fumigate the commies out there — just that the bureau’s “skittishness” may steam from its turbulent and sad history.In any case, I think we’ll let MLC rest in peace now.Let’s have a parade when she comes back. Um, but what’s this I hear? — is it true that the latest consular cable has an odd item discouraging the conception, immaculate or otherwise, of a consular blog? Oh, please, do tell. At dawn on October 29, at Dover Air Force Base in Delaware, the bodies of the three DEA special agents and 15 U.S. troops who died recently in Afghanistan were received by President Obama, Attorney General Eric Holder and Michele Leonhart, the acting administrator of the Drug Enforcement Administration. 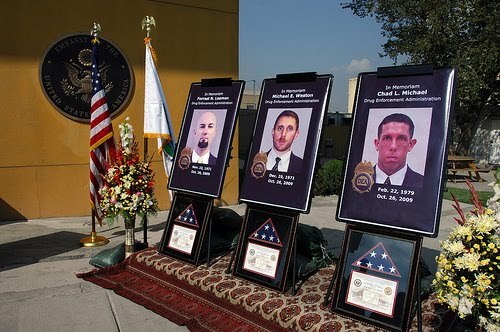 That same day, the US Embassy Kabul held a ceremony to honor the three DEA agents who lost their lives in the line of duty on October 26. The three special agents – Michael Weston, Chad Michael and Forrest Leamon — members of the Kabul Country Office, died when the U.S. military helicopter they were on crashed while returning from a joint counter narcotics mission in Western Afghanistan. DOD has now identified the seven soldiers who also died that day. The helicopter was an MH-47 helicopter and the crash occurred in Darreh-ye Bum, Afghanistan. The soldiers names are here. Our thoughts and prayers to the loved ones they left behind. More photos here of the US Embassy Kabul ceremony. On June 18, AFSA honored seven members of the Foreign Service community for their extraordinary work in the field, including three who were honored for their constructive dissent. These individuals serve as an inspiration to all members of the Foreign Service. However, two AFSA constructive dissent awards were not given out at the ceremony: the Herter Award for a senior FSO, and the Harriman Award for an entry-level officer. Why not? Because there was not a single nomination in either of these two categories. In trying to determine the reason for this, one AFSA staffer astutely postulated: “The entry-level officers are too junior to rock the boat, and the senior FSOs don’t want to jeopardize their position of power.” This may well be true. And once we started thinking about it, we wanted to find out. So AFSA is offering a challenge to the FS community worldwide: Prove this theory wrong. Read A Challenge to Honor Dissent, FSJ November 2009, p.51, online edition. The November issue of the Foreign Service Journal (FSJ) is out. It features The FS Blogosphere in 2009 written by Mark Hay, a student at Columbia University who was an editorial intern in the Journal. The piece divided the blogs into three broad categories — FS members’ journals, family-member accounts and, finally, critical or analytical offerings. Within each, there are various subsets as follows: The Journal, Slices of Life, The Training Journal, Trailing Spouses, Both Spouses-Approach, How-To Guides, Thoughtful Musings, News with an FS Bent, and Retirees’ Reflections. Some of our favorite FS blogs made the list (NDS, TH, Jill, Donna), and some did not. Most conspicuously absent, of course is — The Consuls’ Files. I’m not sure if the lead-time for the magazine is one or two months. But Madam le Consul was certainly not dead yet in September 2009. Consul-At-Arms II, Life After Jerusalem, Avuncular American and John Brown’s Public Diplomacy and Blog Review, as well as John Brown’s Notes and Essays are all alive and well but are not on the list. (John Brown, yes, one of the three FSOs who quit over Iraq). DiploPundit (I think that’s us), made the list under News with an FS Bent “In these news aggregators, discerning bloggers cull the news for stories of interest to diplomats and either present them unaltered or with a dash of insider commentary. Regardless of the garnish and delivery, they are among the premier sources for pre-filtered diplomatic news.” Reinventing Public Diplomacy is on the list but that blog has not been updated since March 8, 2009. Our blog friend, TSB at The Skeptical Bureaucrat made the same list with us. The FSJ is the trade publication of the Foreign Service with a circulation of 15,000 and approximately 30,000 readers. We appreciate the blog press; just hope we won’t see a blog cop carrying a big hammer and a deletrius gun (used to disintegrate, or ‘delete’, an object) with nothing better to do, try and knock on our door in the weeks ahead. Dude, you know we have a disclaimer, right? No ostrich has been harmed in the writing of this blog.